← DEAN’S LIST: IS IT TIME FOR ARSENAL TECH TO LEAVE THE NORTH CENTRAL CONFERENCE? KOKOMO, Ind. 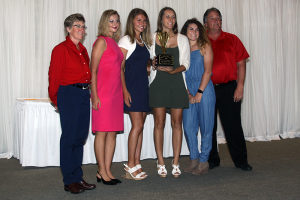 – The Indiana University Kokomo athletic department recently gathered at Bel Air Events for its annual Celebration of Champions. The Cougars athletic program, which just finished its seventh season of competition, has grown from the original men’s basketball and volleyball teams to a total of seven teams, with two more starting this fall (women’s tennis and baseball). IUK Chancellor Dr. Susan Sciame-Gieseke said she is thrilled with the growth of the program. She is also thankful for the way the student-athletes represent the school in public. IUK Athletic Director Greg Cooper said he was appreciative of the coaches who are leading the Cougar athletes. And while trying not to single any out, he did have additional praise for then interim women’s basketball head coach Carlee Cottrell, who took over the program mid-season and helped lead the Cougars to a River States Conference runners-up finish and a berth in the NAIA national tourney. “I truly have one of the best jobs in the country, and I say that because my job is sports,” said Cooper. “But I take it seriously, and I know our coaches do as well. With nearly 240 in attendance, the rest of the event was dedicated to an awards program for the student-athletes. Junior Brooke Runyon led things off by earning the Cougar Community Spirit Award. The award is presented for an athlete’s commitment to community service both on and off the campus. Runyon was also recently recognized with the Women Helping Women Student Volunteer Leadership Award, which was presented by IU First Lady Laurie Burns McRobbie. Runyon, a secondary education major from Noblesville, serves as the American Red Cross blood drive coordinator for the campus through the Red Cross/NAIA Leadership Program. She said her goal is to help people overcome their fears about giving blood. Women’s basketball player Deja Felder was named the Female Athlete of the Year after becoming the first female member of the 1,000 Point Club and leading the Cougars to the NAIA Division II women’s national tournament. The junior finished ranked in the top 45 in the nation in nine categories, including No. 16 in steals (83) and No. 25 in assists (124). Men’s basketball player Trent Elliott became the second Cougar in the men’s 1,000 Point Club, doing so in just two seasons, and was named the Male Athlete of the Year. He finished the season No. 12 in the nation in free throw percentage (.870) and No. 17 in points per game (21.06). The two-sport standout is also a member of the Cougars golf team. In a close battle for the Chancellor’s Cup, the women’s golf team took top honors after accumulating a grade point average of 3.52. “As a department, we had a 3.17 GPA in the fall and a 3.33 last spring,” added Cooper. Also in academics, 24 Cougars were named RSC Scholar-Athletes as sophomores or above with a 3.25 GPA: (Volleyball) Lexi Brickner, Kaley Harness, Brook Karle, Nicole Sandmann, Elyse Younger, Lindi Thomas, Kaleigh Ensley and Casey Colgate; (women’s cross country) Hannah High, Karly Sprouse, Breanne Robertson and Brooke Runyon; (men’s cross country) Brad Jakes, Ethan Dubbels and Shad Jakes; (women’s basketball) Dejianna Butler and Deja Felder; (men’s basketball) Christian Smith and Toby VanLiew; (men’s golf) Seth Grimme, Kaleb Harness and Austin Welch; (women’s golf) Bailey Troutman and Lela Crawford. Daktronics-NAIA Scholar-Athletes (junior or above with a 3.5 GPA) included Thomas, Ensley, Colgate, High, Sprouse, Robertson, Shad Jakes, Felder, Smith, Crawford and Troutman. The Cougar Pride Scholarship was started a year ago thanks to a generous donation by Indiana University graduates and IU Kokomo supporters Dr. Richard and Betty Lasbury. This year’s recipients were men’s cross country sophomore Ethan Dubbels – a Northwestern High School graduate – and Deja Felder. The City of Kokomo earned the Cougar Community Spirit Award. The city earned the award for supporting the Cougar athletic program, including providing the Foster Park tennis courts and Kokomo Municipal Stadium free of charge. Other awards included: Newcomer of the Year, McKenna Lundy (volleyball); Comeback Award, Shad Jakes (men’s cross country); Breakthrough Athlete of the Year, Brittany Sloan (women’s cross country); and the Legacy Award, Tyler Lucas (men’s cross country). Senior awards were presented to: (Men’s golf) Ben Constable; (volleyball) Keeana Walton, Kaleigh Ensley and Kaley Harness; (women’s cross country) Hannah High and Breanne Robertson; (men’s cross country) Brad Jakes and Tyler Lucas; (men’s basketball) Micah Pier and Eric Miller. For more on the IU Kokomo athletic program, visit www.iukcougars.com. This entry was posted in IU Kokomo, River States Conference. Bookmark the permalink.